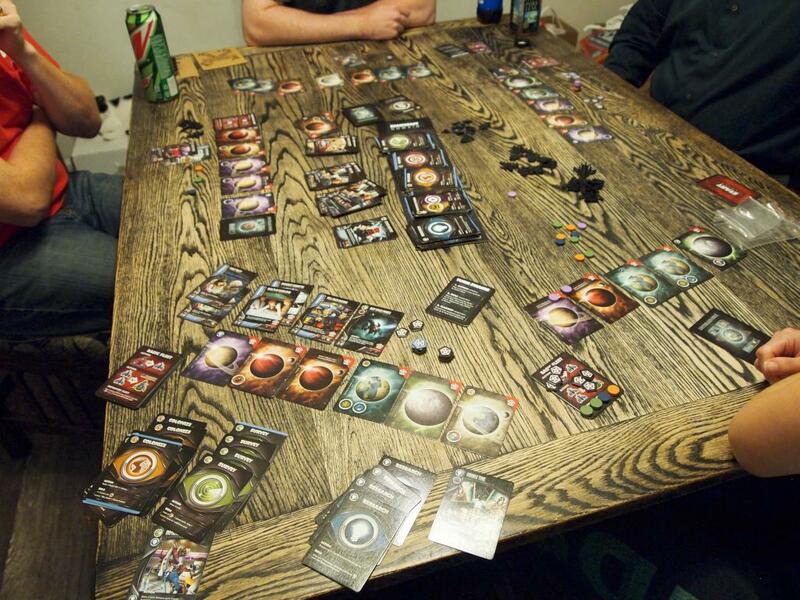 Joe, Kevin, Louis, Gina and I kicked off games Saturday evening with Eminent Domain along with the expansion. I decided to focus on colonization and research. I quickly settled my first planet and then picked up a Peace Treaty to benefit from Joe and Louis’ warfare roles. The others were quickly expanding their empires, while I focused on the research. I managed to get two metalic planets, but the technologies available weren’t terribly useful. I picked up a bunch of points early with the Peace Treaties, and then finished the game with a bunch of technology and a prestige planet that I picked up using the planet recon technology. I had a sizable lead in point and handily took the win with 42. The next closest was 26. 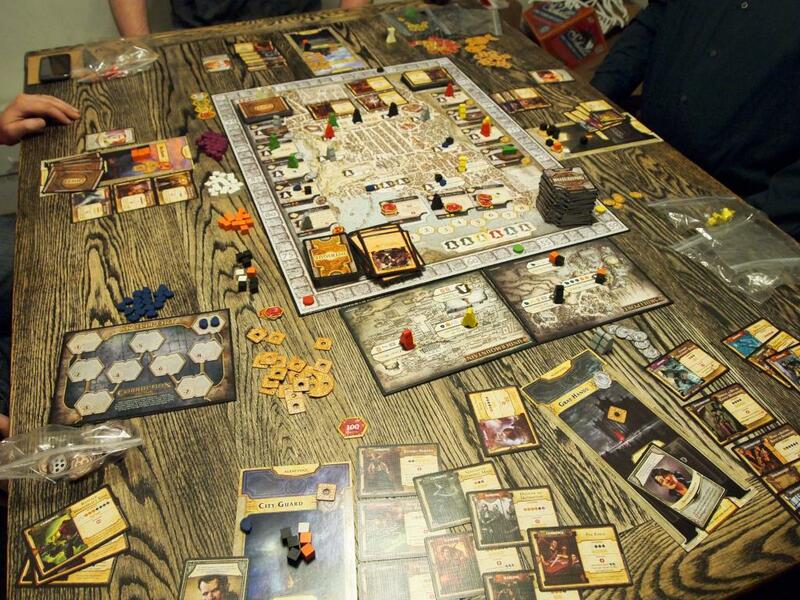 We followed that with Lords of Waterdeep with the Scoundrels of Skullport expansion. I was aiming for Warfare and Commerce quests. I managed to get 10 of them completed, but most were smaller points. Joe was able to build a building that provided 10 points for three adventurers. Plus he had a quest that let him get the owner bonus when he used his own buildings. He was consistently getting 12 points from that building, since everyone was focused on their own quests and didn’t bother to contest the building. Corruption flew off the board, and the building that removed it from the game was available. There were a couple points late where I had to take a 10 point hit to do an action, which ended up hurting my score significantly. Louis, Kevin and Gina were doing well, but couldn’t catch Joe. I was joined by Joe, his friend Brent, Kevin, and Louis on Saturday. We started off with Chicago Express. I wanted to take the green line across country to Chicago and I did manage to get the first share of it, but things didn’t quite go as planned. Joe, who didn’t have any shares quickly put the second share up for bid and it ended up with Brent. 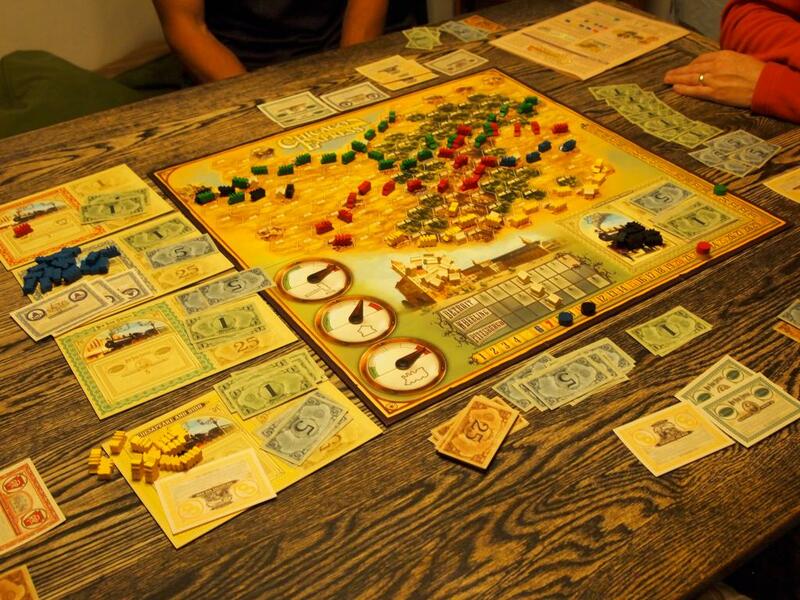 Louis had sole control of Red, but Brent and I were making it difficult for red to continue. 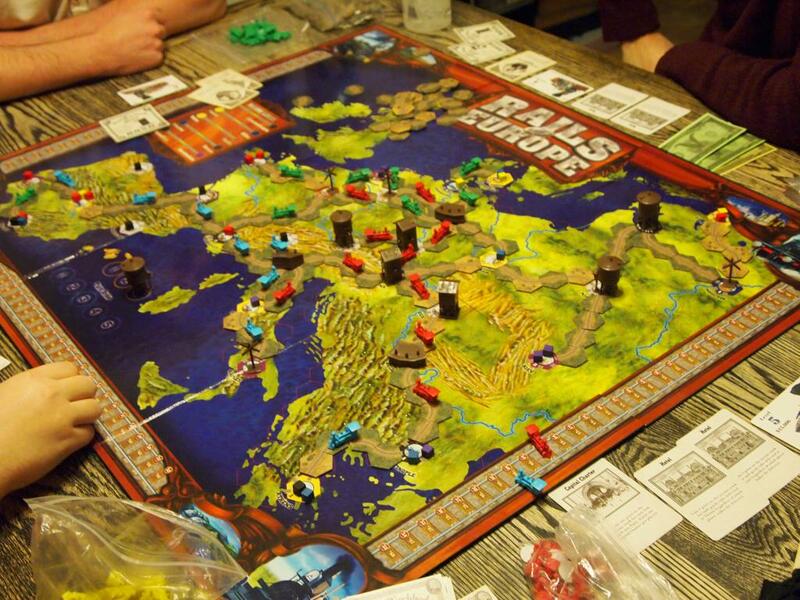 Blue was pretty much halted after its first expansion. Brent and I were working well on green. Eventually, though, I lost any semblance of control when Kevin picked up a share and Brent bought a second. At this point I knew I was out of it, so I tried to derail green, but was unable to before Kevin connected it to Chicago. Brent picked up the first black share, and I quickly bought the second. It didn’t end up mattering much. Kevin quietly had control of green and yellow and was making quite a bit each dividend. He finished with over $70 and the victory. 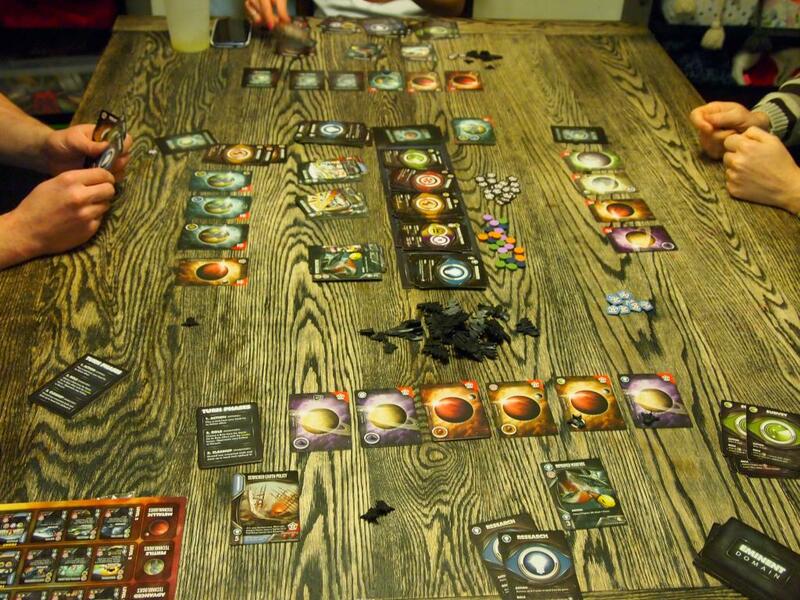 We followed that with Eminent Domain including the Escalation expansion. It was interesting. It took a bit to explain everything, since Brent hadn’t played before. Once we got going, it was a little slow as well. Adding a fifth player seemed to add a bit if you weren’t following the other players’ action often. 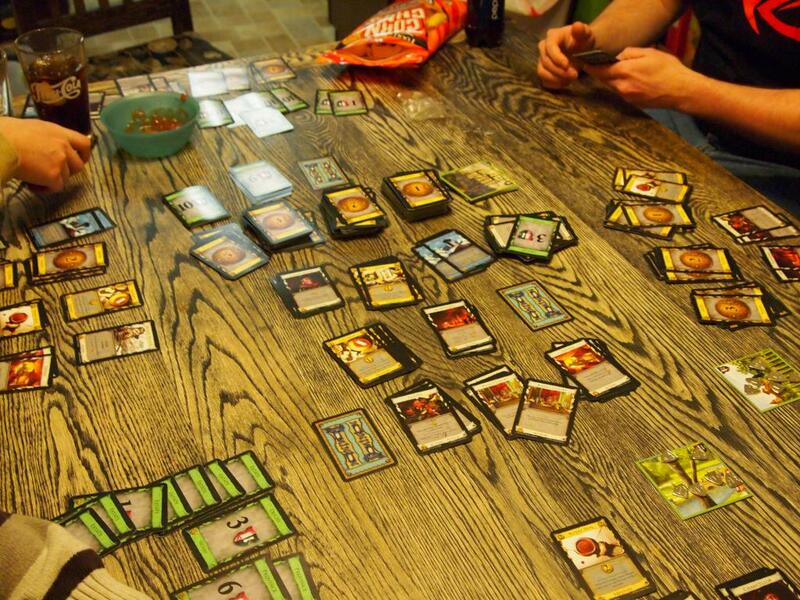 Joe was doing some warfare, while Kevin and Brent each had Peace Treaties in play for bonus points. Louis and I were working with production and trade, but I was slow to get started due to expensive planets. Kevin had picked up a bunch of research cards and got a nice combination being able to get replenishing fighters and the ability to trade fighters like resources. Kevin won with a score in the 40’s. 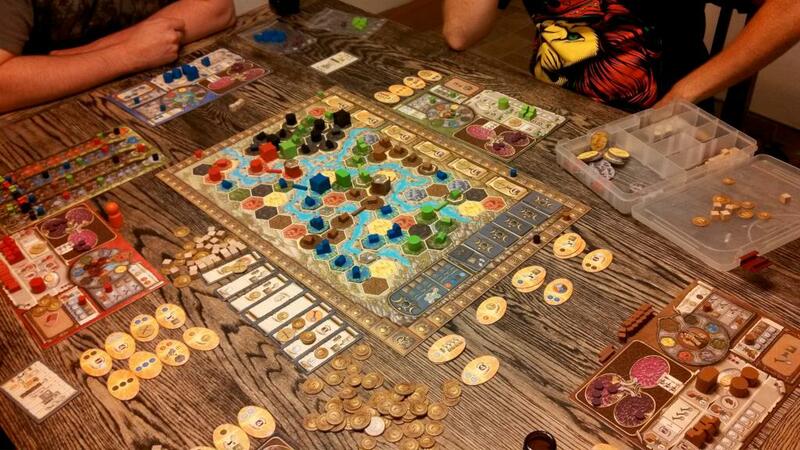 Louis, Kevin and I kicked Saturday off with Terra Mystica. Louis was playing the Giants, I had the Halflings and Kevin the Merfolk. 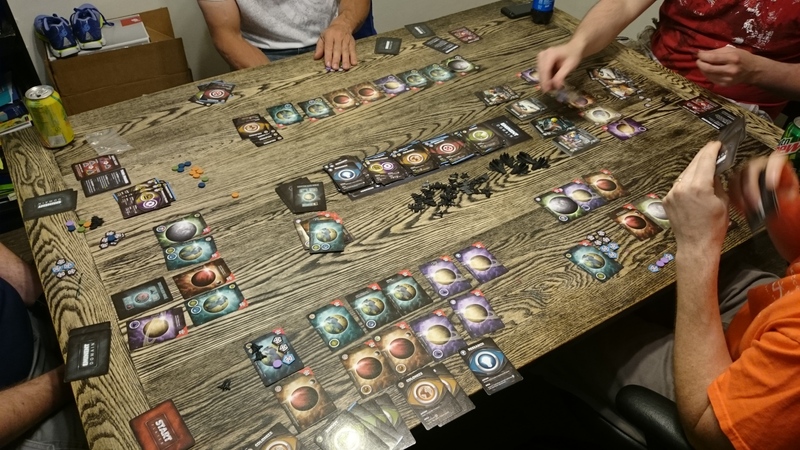 With only three players, it was tougher to build next to each other, but we all managed to cluster in the upper center of the board with our initial buildings. I was the first to get a town, with a Sanctuary and two trading posts. Once I got that completed, I went to work digging in the lower right of the board. Kevin had taken control of the fire and water cults, while I had my hands in air and earth. Louis had built a decent lead, but I was able to catch up. My expansion was able to challenge Kevin for largest empire, but I was one short. I thought I could keep him out of the lead in both earth and air, but ended up losing out in air anyways. That effort cost me a couple points from not building my last dwelling, and Kevin beat me by three points. 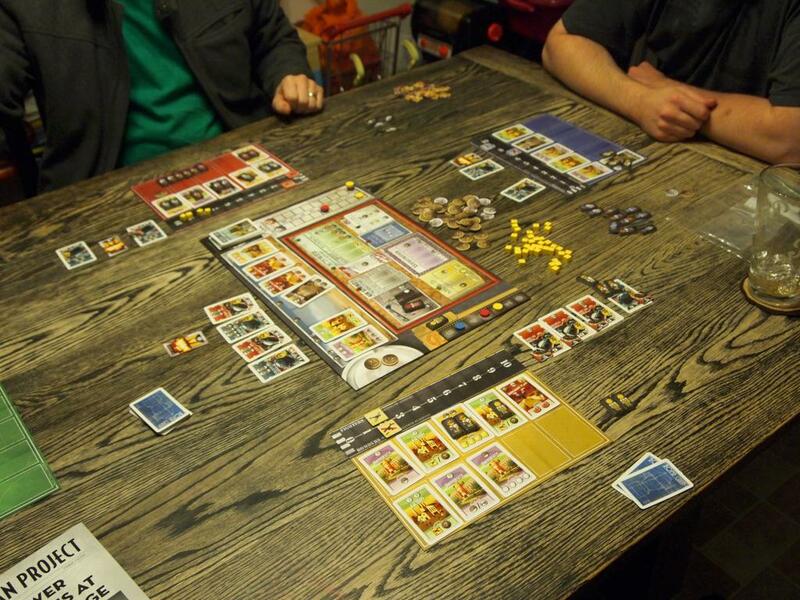 Dana, Gina and Joe joined us, and we busted out Dominion, with the Intrigue and Prosperity expansions. I was the first to buy an Expand and proceeded to use it to transform many of my Estates into Duchies, and further. My deck worked quite well, with a King’s Court providing a couple extra expansions. I managed to finish the game with three Colonies, only one of which I had actually purchased. My 41 points was enough for the win. 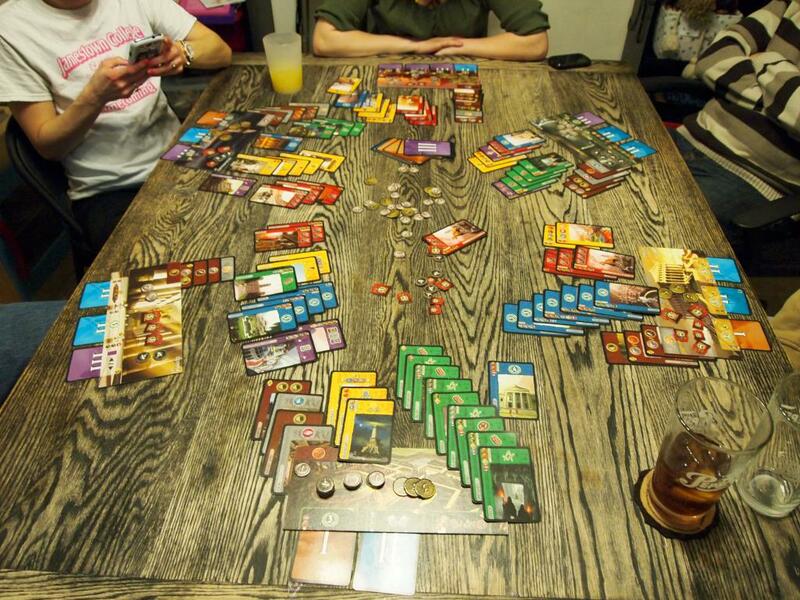 We followed that up with 7 Wonders. I thought I was doing well with science, picking up four compasses, four tablets and a gear, but I missed out on the clay needed to get my third wonder entry. Louis was next to me, and he was grabbing all of the Civilian cards available. He finished with 40 points just from that, and another 18 from military. He won with a solid 71 points. 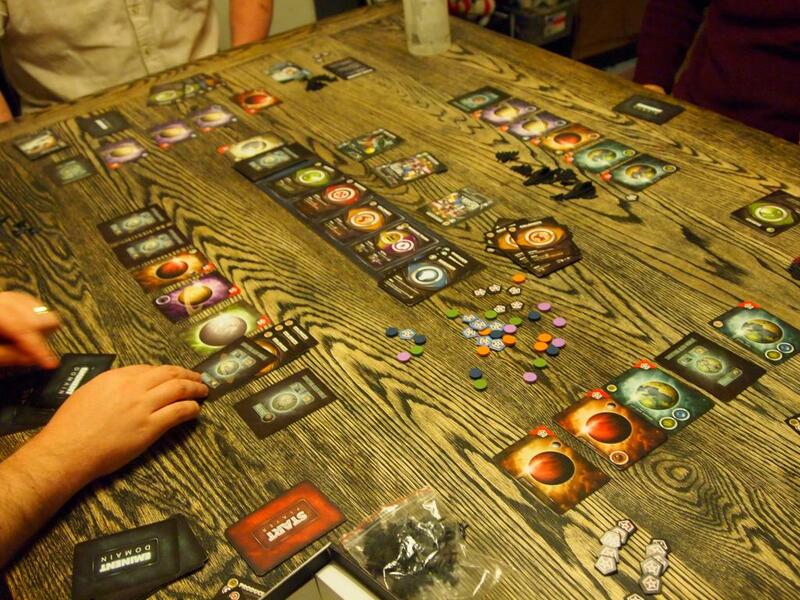 Louis and Dana took off, but the rest of us stuck around for one last game of Eminent Domain. I focused heavily on military, while the rest mostly were colonizing. There was a lot of surveying as well, especially by Joe who was trying to survey and colonize as much as possible, while trashing as many cards as he could. All of their surveying helped me get a decent number of planets, so I could focus on warfare and research. I ended up with six colonized planets and a level two research card. I ended the game relatively quickly with the last survey card, so my 19 points was just enough to get the victory. 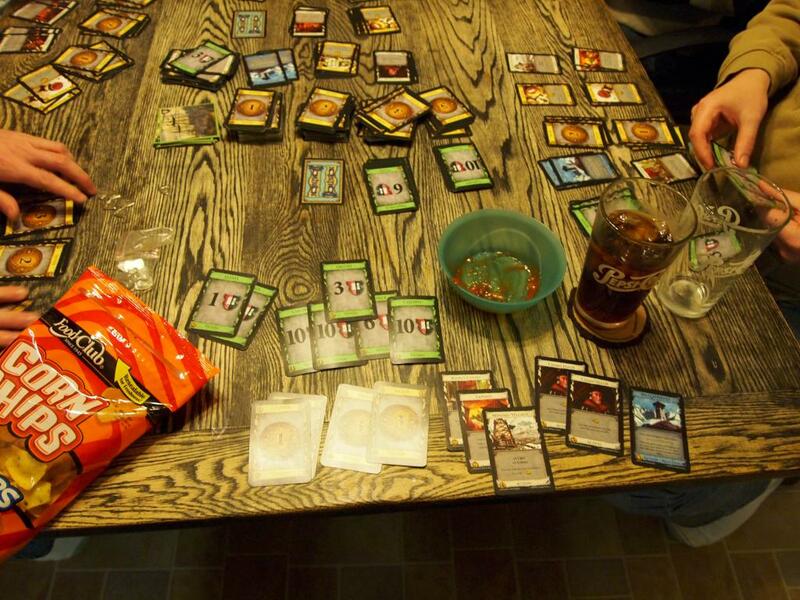 With Gina sitting the night out, and Phil and Louis out of town, it was up to Kevin, Joe and I to play games Saturday. 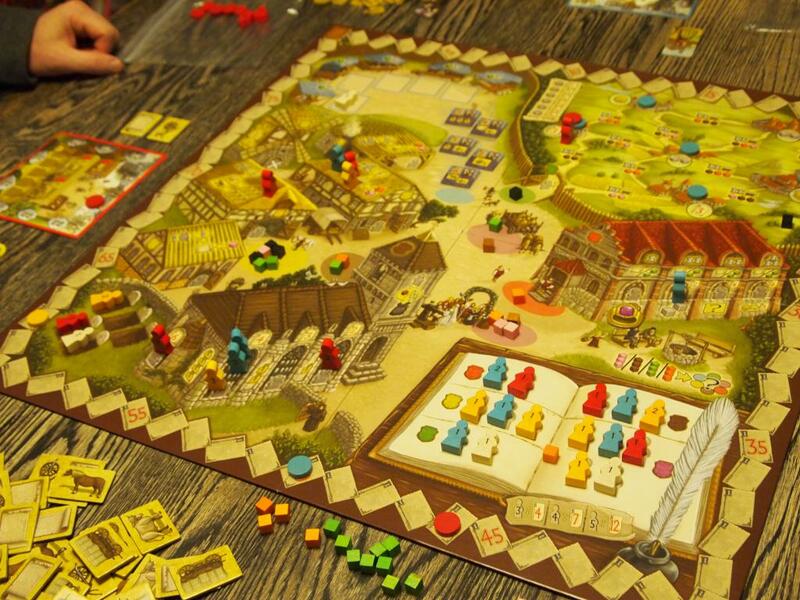 We kicked things off with a quick game of Village. I decided to go straight for the market, spending my time in the crafting area building stuff to sell. Joe was working in the Council House and Kevin was travelling. I spent a lot of time, and ended up with five family members in the book, and one in the unmarked graves. This was all done in the crafting house and I was able to pick up 46 points worth of sales. Joe tried to jump in and interrupt my game, but I had things timed well and with Kevin going first most of the game I was always able to score the high point sales before Joe could. I ended up winning with 62. Next up was The Manhattan Project. There were a ton of universities available in the market, so extra workers weren’t much of a problem. Yellow cake was tougher to get, though, with Joe and I having the best sources. There was a fair bit of espionage because of that. The bombs available early, were mostly plutonium, but I did get my hands on the two low point uranium bombs and was able to build and load them rather early. Joe had a medium plutonium bomb and Kevin had tested a bomb by this point. I was setting up for another small bomb and managed to build that about the time Kevin had built his big plutonium bomb. I was 13 points away, and Kevin was pretty well setup to get his second big bomb built to win on his next action, but he had to recall first. When he recalled, I was able to use my spy to get into his plutonium plant to get the four that I needed to build and subsequently load a bomb for 14 points and the victory. 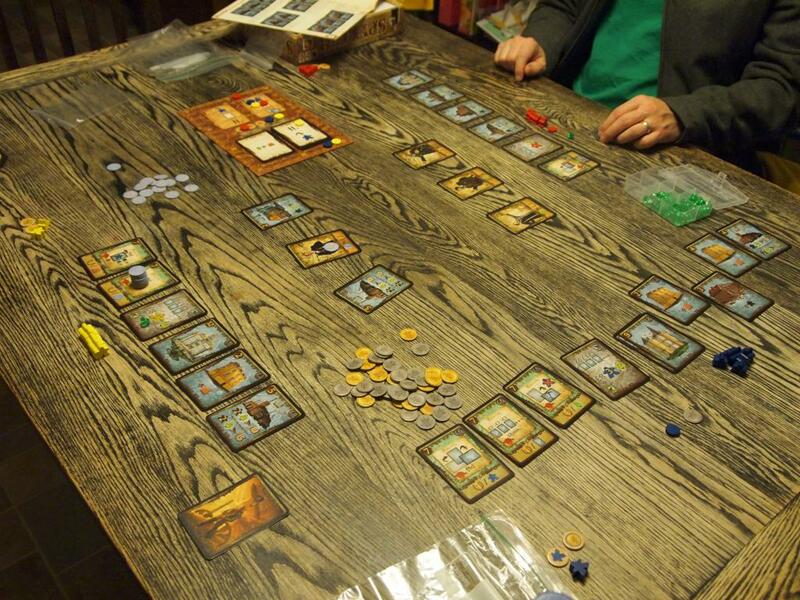 We followed that with Spyrium. 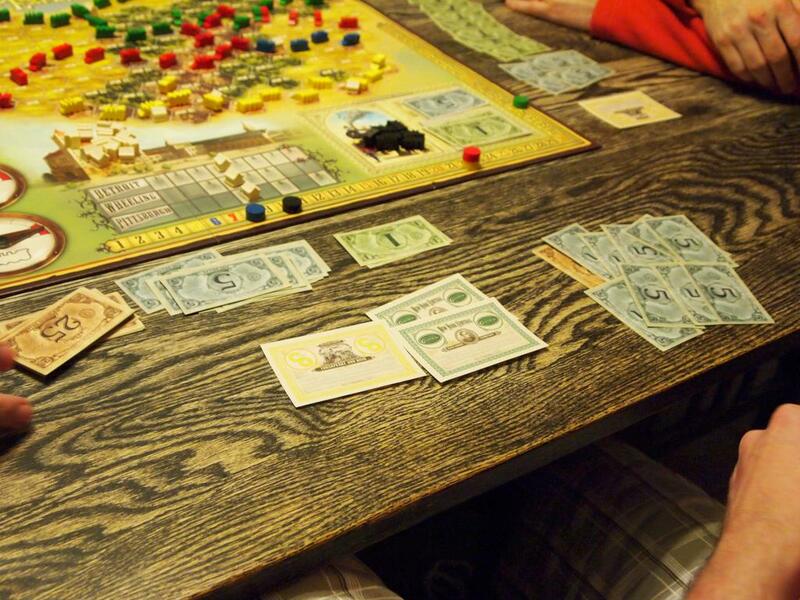 I was pushing for residences and the blue tokens early, but I didn’t have much going in my tableau. Kevin was mining a bunch, wasn’t scoring many points, while Joe was setup with factories. Eventually I was able to get a bunch of points with a factory and university. It wasn’t quite enough, though. Kevin had started scoring points with a factory, and while I managed to grab a nice mansion in the last round, I still ended up a point shy of Kevin at the end. 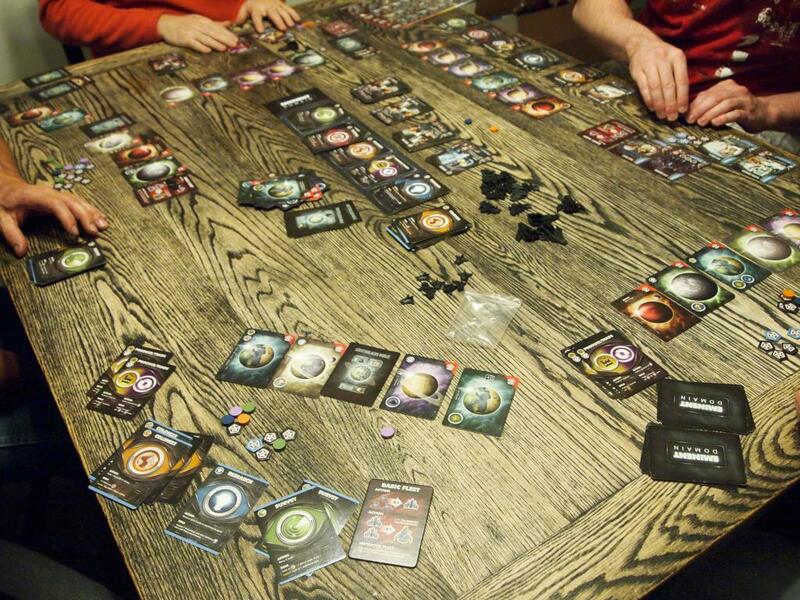 We finished the night with Eminent Domain. We were all pushing for colonies, so grabbing planets was critical. I surveyed early and often, which provided two prestige planets and two planets with colonize bonuses. I was also able to score a few nice research cards with the help of Joe’s research actions. Kevin was trying to get a production and trading engine going, but the research and colonize cards were disappearing too quickly. 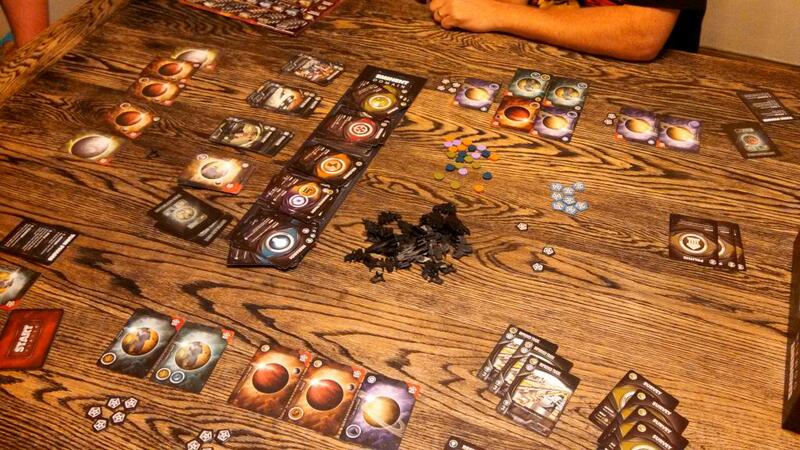 Joe had a bunch of planets as well, but hadn’t been able to colonize them. I won the game with a score of 31. 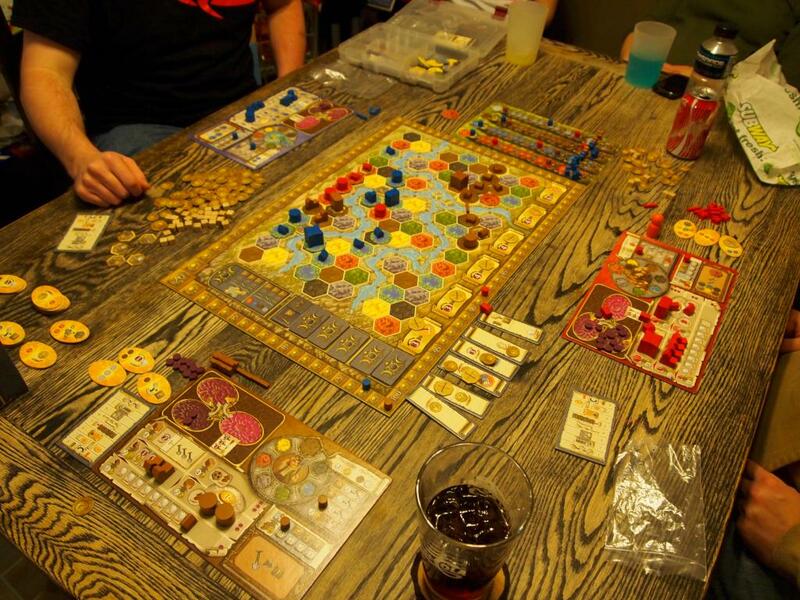 Joe, Kevin and Louis joined Gina and I Saturday for a game of Terra Mystica. Louis was playing as the Chaos Magicians, Kevin the Mermaids, Joe the Witches, Gina the Hobbits and I had the Darklings. Gina got off to a very fast start taking advantage of her digging bonuses and the round bonus for building dwellings. Louis and I were lagging behind a fair bit, but we were getting power from Joe on the left side of the board. I went straight for a Temple to start powering my terraforming. I wasn’t able to really take advantage of the round bonus, as the second and third rounds rewarded building the big buildings. I just didn’t have the income until the fourth round. Then I really got moving. I was able to get two towns built, and then upgraded to the big buildings on the second to last round. 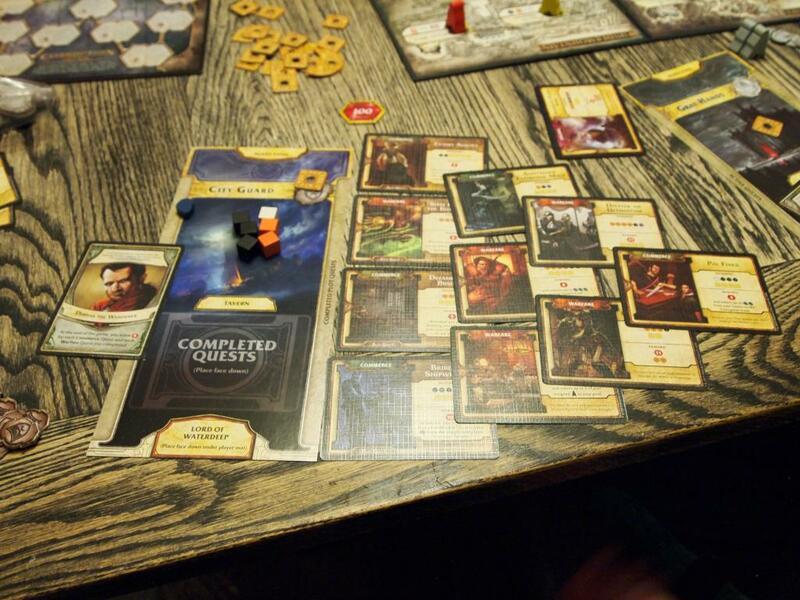 I then started heavily using my priests to take over the cult board. 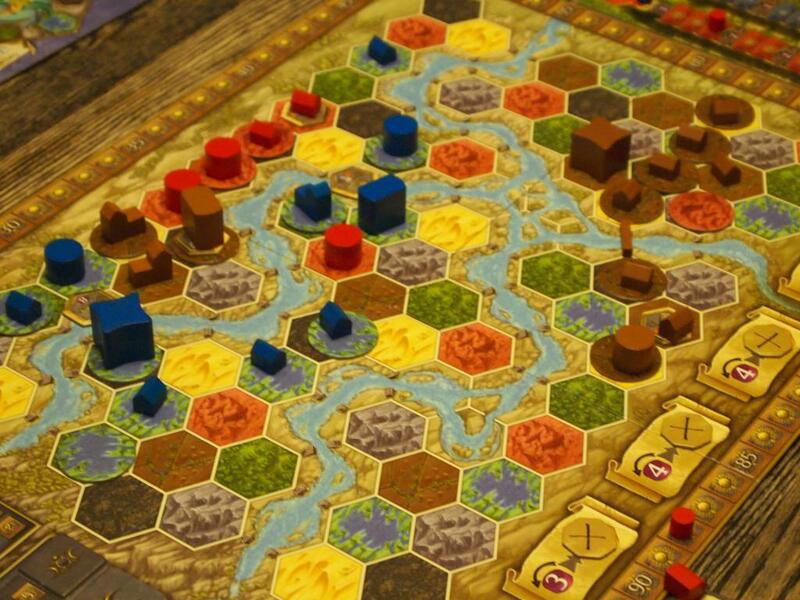 Joe had managed three towns by the end, and spent the last round positioning himself on the cult tracks, which he had ignored for the rest of the game. He didn’t have enough to get ahead of me in any but water, but he was second in the rest. Louis took the earth track, while I held fire and air. The final scores were rather close. Kevin had the biggest empire, but Gina and I tied for second. 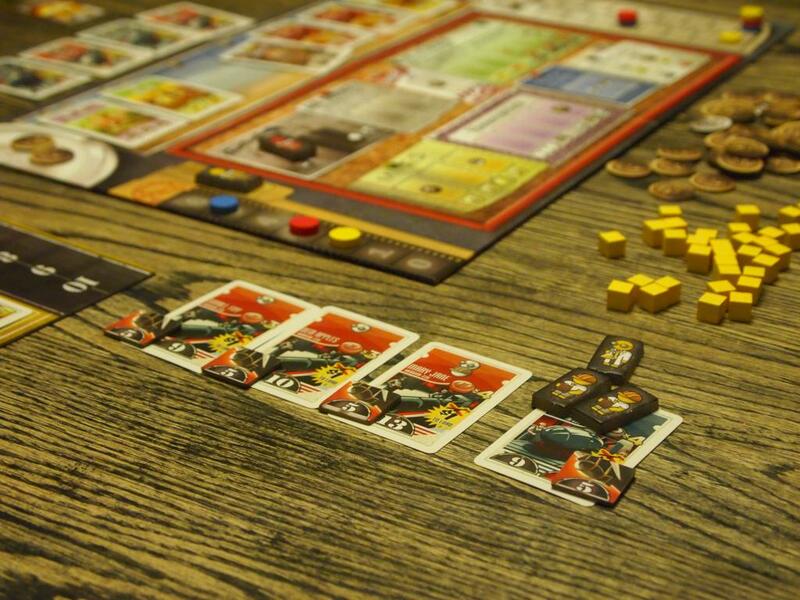 I had enough on the cult track to overcome her lead, and was able to score the win by just a few points. 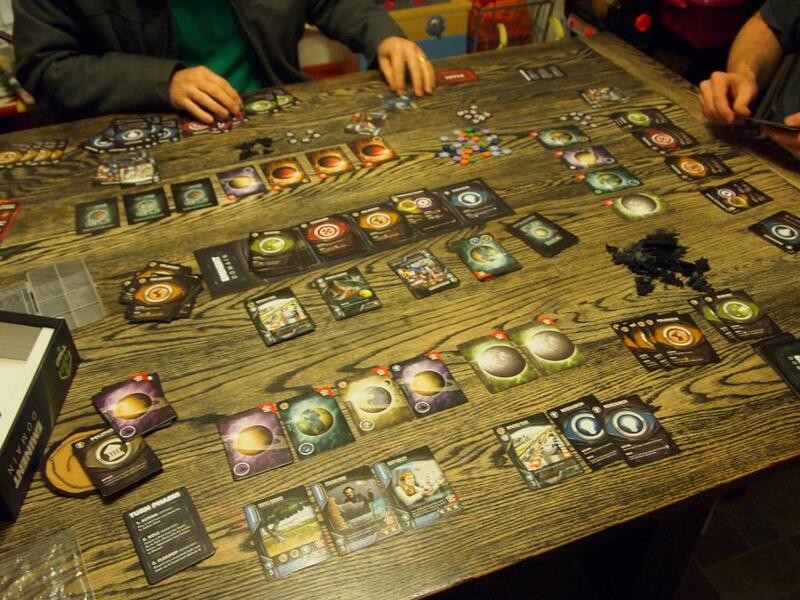 Gina and Louis called it quits, so Joe, Kevin and I played Eminent Domain. Joe and I were pressing the Survey and Colonize fairly heavily early, while Kevin was going the Warfare route. Once I had a couple planets colonized, though, I was able to get into the Produce/Trade business. I was drawing cards perfectly, and rarely missed a chance to score with my goods. 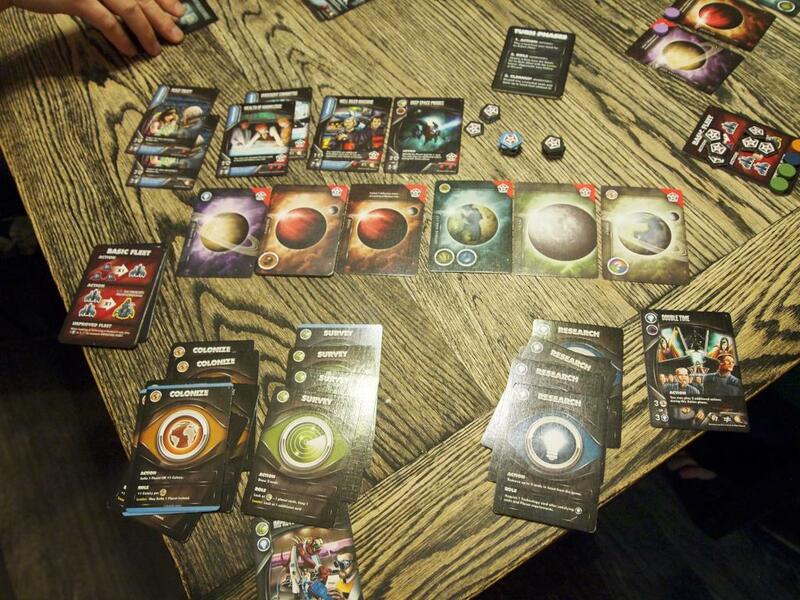 At the end of the game I had 15 points from goods along with my 15 from my four planets. Kevin and Joe each had 27; Kevin from Planets and research; Joe from mostly planets, though he did have a few from trade. 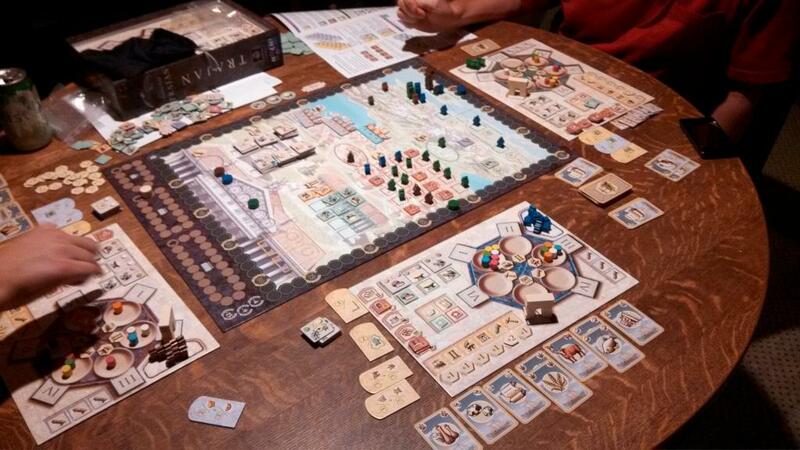 I finished the weekend off with a game of Trajan with Joe and Louis. It was my first time playing, so there was definitely a learning curve. I was working the legionaires and the senate for my bonus tiles. Louis was grabbing up trajan tiles and the shipping tiles, while Joe was left to run free in the workman area. That was a big mistake, as Joe pulled in 40 points of bonuses just from the workmen. I did end up in second with a strong endgame and finished a couple points ahead of Louis.